Dr. Sheila Mohammed is board certified and licensed in Florida, Arizona, Pennsylvania, Indiana and Hawaii. As a Medical Doctor, she is focused on treating, correcting and preventing the cause of your painful condition. Each patient receives a personalized approach to their specific condition that includes an in-depth consultation, examination and an individualized treatment plan. No two treatment plans are ever the same for patients. Each patient always receives the time they need to fully explain and discuss their condition. Dr. Sheila Mohammed had the honor of being personally trained in prolotherapy by Dr. Kent Pomeroy, M.D., who was one of the few recognized prolotherapy specialists in the world. He was introduced to Prolotherapy by Gustav Hemwall, M.D. who is considered the grandfather of Prolotherapy. As both an allopathic and holistic medical practioner, Dr. Mohammed specializes in the treatment of Pain Rehabilitation Services by combining both Eastern and Western medical approaches. She offers other services that includes Prolotherapy, Prolozone, Ozone, Platelet Rich Plasma, Stem Cell Treatments, Acupuncture, Chinese Herbal Medicines, Core Cleansing Medical Weight Loss, and Customized Nutrition. Dr. Sheila Mohammed also practices aesthetic medicine with extensive training accumulated by experience working in medical spas. 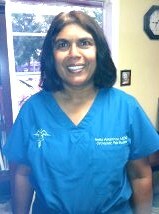 Dr. Sheila Mohammed attended the University of South Florida and graduated in 2008. She then obtained her Masters Degree in Public Health and is currently finishing her PhD in toxicology and risk assessment at USF’s College of Public Health. During her residency, she trained at two Veterans Administration (“VA”) hospitals in Tampa, FL which helped her understand the diverse needs of our service members. She trained in rehabilitation medicine at the University of Pittsburg Mercy Hospital. In addition, Dr. Mohammed is a British trained doctor and offered clinical training in London.